Period homes enjoy a timeless appeal but score, less highly on energy efficiency. Gary Warby, Managing Director, Premier Windows explores what you can do to increase the thermal performance of your home. The case for improving the energy efficiency of your home speaks for itself. According to government research upping the Energy Performance Certificate (EPC) of your home from a Band D to a Band B, can add £16,000 or more to its value, in addition to making it more likely to sell. This should be food for thought for owners of older properties. According to Energy Performance Certificate data 84.4% of new builds have the top A or B rating for energy efficiency compared to just 2.2% of existing properties. This means that owners of older properties are not only spending almost £700 more per year on energy bills compared to owners of newer and more energy efficient properties but that they may become far more difficult to sell in the future. How to improve the energy efficiency of older properties There are two distinct challenges raised when improving the energy efficiency of older properties. The first is the construct of the building. With most pre-war homes built with solid walls, cavity wall insulation is out. With around a third of heat escaping from the home through uninsulated walls, this sets period properties at a clear disadvantage in the home energy efficiency stakes. External wall insulation is an option, but this is fraught with potential risks and possible damp problems so expert advice is a prerequisite. This makes turning your attention to those areas where you can cut home energy consumption all the more important including loft insulation with professionally installed loft insulation for a typical three-bedroom, semi-detached house with gas central heating offering savings of up to £180 per year. How energy efficient windows can cut the heating bills of period homes According to the Energy Saving Trust after energy leaking roof space and walls, windows account for around 20% of the heat lost from your home, which means that if you haven’t already done so, replacing them could pay back dividends in the long run. Heat loss can be cut by up to 75 per cent when Energy efficient windows and doors. In a detached three-bedroom home, according to the Energy Saving Trust, this can equate to an annual saving over and above single – and in many cases, older double-glazed windows – of up to £160 a year in heating bills. This, however, raises the second key challenge. 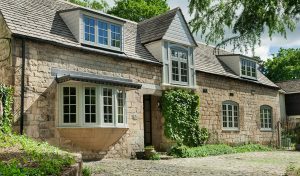 Windows are key in defining the character of your property and even more so in period homes, so identifying the right windows which deliver on performance as well as providing a sympathetic match to the original design of your home is key. Replacing windows in Listed Buildings and Conservation Areas If you’re the owner of a Listed period property, you’ll already know that there are strict controls on what you can and can’t do. The focus here is firmly on renewal and repair of original windows. Secondary glazing, which sits inside the window aperture may be an option, significantly improving energy efficiency over single glazed windows but you need to work with your local authority conservation team before installing it. These restrictions don’t apply to all period homes. Most pre-war period homes in the UK were built in the Victorian and Edwardian periods. In most cases these won’t be listed and even where they sit within a Conservation Area, new windows can be installed. The critical thing is their design – and if in any doubt – to check with your local authority conservation team before making changes. Energy efficient replacement windows for period homes Unless you’re fortunate enough to own a stately home or ‘chocolate box cottage’ most hard-to-treat period properties still occupied in the UK were built in the Victorian or Edwardian periods and are not subject to listing or conservation controls. Nonetheless, finding an energy efficient window which can be used as a sympathetic replacement to original windows is key. The defining feature on original timber windows in older and period homes, is that the opening part of a casement window or sash closes so that it sits flush with the frame. This represents a distinct difference in design when compared to a standard energy efficient replacement u-PVC window, where the sash protrudes out and over the frame to form a weather seal. This tends to be the main reason why standard PVC windows aren’t always right for period properties. Premier Window supplies one of the UK’s leading energy efficient flush sash casement windows. Designed and manufactured in the UK, it’s been developed to offer an almost indiscernible match to traditional timber flush casements, making it the perfect choice for a wide range of period properties. With a defining flush casement finish, mechanically jointed options, traditional top and deep bottom sash rail options, the details of traditional timber flush casement windows are perfectly replicated in a low maintenance and energy efficient heritage double-glazed window. It’s also available with heritage dummy sash options on frames with fixed lights and integrated hardware including period character defining monkey-tail handles and dummy peg stays. It does all of this, while still delivering an exceptionally high level of thermal performance, achieving a WER A+ window as standard while typical U-values start at 1.3W/m2K, when combined with energy efficient double and triple-glazed glazing options featuring warm-edge spacers and low-e coatings. As with all building products taking time to understand and make the right choices is key. The great news for owners of period homes, however, is that they can combine advanced thermal performance in energy efficient replacement windows with a wide range of sympathetic designs.